The idea behind Stick n Find lies somewhere between good and great – the reality, sadly, doesn’t quite meet the aspirations. 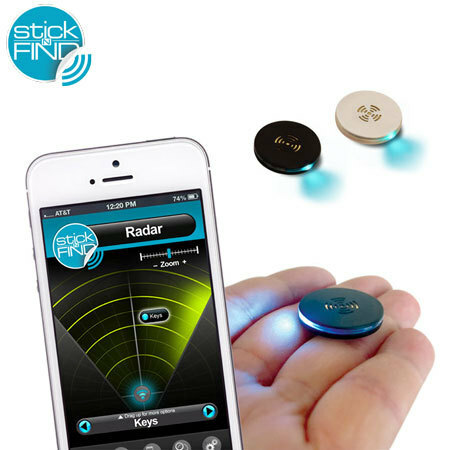 Stick n Find are coin-sized gadgets that you can attach to your keys, glasses case, remote-control or anything else you might lose. You can then use your phone or tablet to locate the devices via a Bluetooth connection. If the devices had worked as advertised they’d be extremely useful. However I found them to be too unreliable to be worth the effort. The devices come very nicely packaged, although the instructions are not the best and the associated app is surprisingly difficult to find in the App Store. Turning the devices on and pairing them with the phone was a breeze. The devices are small enough and light enough that you could happily and unobtrusively use them to locate keys or other relatively small objects. I kept thinking they’d be great for finding bags at the airport now that airlines are relaxing controls on Bluetooth during takeoff and landing. All would be great if the location part worked as expected, but I just couldn’t get a reliable result no matter what I tried. The location is not based on direction, just on proximity (it uses the signal strength to determine if you are getting closer) so it’s like someone shouting ‘colder’ ‘warmer’ to you as you search the room. That’s an inherent limitation and I expected that. But I found the signal strength results to be inconsistent – sometimes it wouldn’t find the device across the room, sometimes it said I was right beside the device when I was within several meters of it. Now I have to admit there might be some user-error in some of this, because I couldn’t seem to get some of the other advertised features working properly either, but reading other reviews on the web I’m not alone in my concerns. That said there are also people out there who seem to have had positive experiences with the product. Stick n Find was provided for review by the lovely folk at Mobilezap. I hate to say it but these would arguably be about a gazillion times more useful if they were capable of just beeping when directed to by the app. They seem big enough to have the technology embedded.